Written by Brian Michael Bendis, art by Rafa Sandoval, cover by Ed McGuinness. Who is the face of true evil in the Ultimate Universe? What is the biggest secret the world doesn't know? Join the gathered heroes as they embark on an adventure unlike anything seen in Marvel ComicsŠand that's a promise! Written by Brian Michael Bendis, pencils and cover by David Lafuente. Mysterio has had just about enough of Spider-Man, so he sends in the Ultimate Spider SlayerŠand sends it right to Peter Parker¹s school! All this and the mystery of the Shroud is finally revealed! Written by Joe Kelly, pencils and cover by Max Fiumara, variant cover by Joe Quinones. The Gauntlet continues to close around Spider-Man in this heartbreaking story of love, loss and lust for power as the Rhino charges into Spider-Man's life, out to make a name for himself...by killing the Rhino? Written by Fred Van Lente, pencield by Javier Pulido, cover by Paolo Manuel Rivera. Mysterious: Chapter One "Un-Murder Incorporated." Mysterio is back from the dead...and he's not alone! When deceased members of the Maggia crime family return from beyond the grave, the balance of power shifts in their gang war with Hammerhead and the Inner-Demons. Can Spider-Man and crime scene investigator, Carlie Cooper, solve this mystery...before it gets a little too personal? Plus: Secret sides of both Mr. Negative and J. Jonah Jameson Sr. revealed, a disturbing turn for Aunt May, the reappearance of another Spider-Villain. Written by Fred Van Lente, penciled by Javier Pulido, cover by Paolo Manuel Rivera. Mysterious: Chapter Two "Re-Appearing Act." Spider-Man vs. Mysterio! How long can Mysterio play with Spidey's head before the web-slinger finally snaps?! The mind games keep ratcheting up as the body count goes up, down, and...into the negatives? Some bad guys just won't die and others can't stay dead! So which long-thought deceased Spider-Man character is back now? It may only be January, but get ready for the most unbelievable Spider-Man moment of the year! Written by Tom DeFalco and Howard Mackie, penciled by Todd Nauck, cover by Sana Takeda. Maximum Clonage! It¹s Hoo-Ha Time as MJ goes into labor while Peter, Ben Reilly, and Kaine have a clone war for the agesŠin the heart of mid-town Manhattan! Only one will walk away as the controversial crossover rockets to its mind-blowing conclusion! Written by Fred Van Lente, Tom DeFalco and Frank Tieri, penciled by Barry Kitson, Ron Frenz and more, cover by Jelena Djurdjevic. Behold Mysterio...looks can be more than just deceiving ­ they can drive you mad. As the Master of Illusion makes his triumphant return to the pages of Amazing Spider-Man, Van Lente and Kitson bring you the real story of Quentin BeckŠor is it just another illusion? Written by Jeff Parker, penciled by Ramon Rosanas, cover by Michael Golden. From the miniseries originally created by Neil Gaiman Peter travels to Venice in search of his new love, but instead finds that Osbourne is still alive...and more dangerous than before. Thanks to the hellish lab of Octavius, this century now has a Green Goblin - bent on revenge! Written by Paul Tobin, pencils and cover by Patrick Scherberger. When the Beyonder created Battleworld, he stocked it with far more than Earth¹s greatest heroes and worst villains. Now, two of these other elements, the city of Denver, Colorado and a warlike alien race known as the Spindlies, are on major collision course. With the other heroes occupied elsewhere, it¹s up to Ben Grimm and the amazing Spider-Man to stand or fall with the city. But who will save them from their powerful on-again, off-again, allyŠDoctor Doom? Written by Marc Guggenheim, penciled by Adriana Melo, cover by David Yardin. From the pages of Amazing Spider-Man! The last Jackpot died in combat alongside Spider-Man ­ so who is the New Jackpot putting fear into the hearts of street criminals? Why has Boomerang targeted her for death? And how is The Rose involved? Written by David Hine and Fabrice Sapolsky, art by Carmine Di Giandomenico, covers by Patrick Zircher and Dennis Calero. Spider-Man has just met one of his deadliest foes. But does he even know it yet? In the crossroads of 1934 America, organized crime cuts a bloody swath through the streets, while political movements like the American Nazi Party promise a vision of a safer world ahead. And with the promise of science to improve Americans¹ lives, Peter Parker is blinded to the evil of his new role model. Will Spider-Man wise up in time and fight? Written by Christos N. Gage, pencils by Rafa Sandoval, cover by David Yardin. Siege Blockbuster tie-in! After Civil War, the members of the Initiative were recruited with promises of glory...fame...wealth...redemption. But all things come with a price -- and now it's time to pay in blood as the entire Initiative find themselves fighting for their lives in an all-out war against Thor and the Asgardians! With the Dark Avengers as their allies and immortal gods as their enemies, the most brutal event in Marvel history is about to ignite, and these Avengers are caught in the middle! And for some, this will be their final stand. Written by Jeff Parker, penciled by Gabriel Hardman, cover by Humberto Ramos, variant cover by Hardman. Spacetime is being selectively eroded by an unknown force. To stop the effect, the Agents of Atlas seek the help of the Avengers- and find a much earlier version of the team than they expected: Captain America, Iron Man, Wasp, Giant-Man and Thor are together again, with the atomic wildcard The Hulk! Written by Jonathan Maberry, penciled by Will Conrad, cover by Paul Renaud. Prelude to "Doomwar." If you think you know what's coming next in Black Panther, guess again. Shuri, T'Challa and Storm are caught up in a tangle of plots within plots as Doctor Doom and the Broker close the jaws of their trap. Heroes will fall, trust will be betrayed, secrets will be revealed, and nothing will ever be the same. The fuse is lit and Wakanda is about to explode. Guest stars Namor and the Fantastic Four jump into action as the new Black Panther goes to war. Written by Paul Cornell, penciled by Tom Raney and John Paul Leon, cover by Adi Granov. Time is running out for the on-the-run Black Widow as the sinister Icepick Protocol sets Clint Barton against Mockingbird -- and Hercules against everybody! With flashbacks to her days with Daredevil and the Champions, and the final revelation of who is trying to destroy her life, the clock is ticking on Natasha¹s life! Written by Paul Tobin, pencils and cover by Salvador Espin. She¹s S.H.I.E.L.D. agent Natasha Romanoff, and Nick Fury has two missions for his newest recruit. First, find out everything possible about the mysterious Ms. Marvel, and deal with her if deemed necessary. Secondly, infiltrate the Red Skull¹s organization and discover the location of one of the Skull¹s ³Sleeper² robots before it spells doom for all mankind. Natasha Romanoff, the Black Widow, is soon to find that combining these two cases is the one way to stay alive. Written by Ed Brubaker, pencils by Luke Ross, cover by Gerald Parel. The monthly Captain America returns with a bang! Where has the Captain America from the '50s been the past few months, and what part of our modern world has welcomed him? And what will Steve and Bucky do when an old enemy tries to become a revolutionary? Two Americas begins here! Plus, the start of a second bonus Feature - Nomad by Sean McKeever and David Baldeon! Written by Ed Brubaker, pencils and cover by Bryan Hitch, covers by John Cassaday, variant cover by Joe Quesada. The story so big we needed another issue to finish it! The return of Captain America! The fight for the body and soul and mind of Steve Rogers! Avengers versus the Red Skull and his cronies! The biggest finale of the year is finally here! Written by Andy Diggle, art by Roberto De La Torre, cover by Esad Ribic. The first story arc from the creative team of Diggle and De La Torre reaches its shattering climax. Backed-up by the ruthlessly loyal ninja army known as The Hand, Daredevil declares war on a murderous cadre of dirty NYPD cops -- and Hell's Kitchen is the battleground! But can Foggy Nelson and Dakota North find out who's really behind the recent spiral of violence before the city burns? Written by Brian Michael Bendis, pencils and cover by Mike Deodato. Siege Blockbuster tie-in! After years of mystery, the secrets of the Sentry are revealed! How deep is his madness and who is really in control of him? What is the limit of his power, if any? And what deadly mystery surrounds him causing mortals and gods to tremble in fear? Written by Charlie Huston, penciled by Lan Medina, cover by Brandon Peterson. Marvel¹s ultimate cyborg is back in this 7-issue Marvel Knights limited series. Deathlok the Demolisher: Tomorrow¹s Super Soldier today. RoXXon Corp created him, they thought they could control him, they were wrong. Now they¹ve got a big problem: a 6-foot-seven, 800-pound Deus Ex Machina made of wires and fibers, circuits and silicon, flesh and bone, is on the loose, bringing the pain to anyone that gets in his way. To bring him down, RoXXon will have to dig deep into its arsenal, and unleash its darkest, most outlandish secrets. Written by Rick Remender, art by Jefte Palo and Gabriel Hardman, cover by Marko Djurdjevic. Nightmare has claimed Earth. His unreal universe of pain and terror has been made tangible and spread across the globe by an army comprised of the world¹s most powerful supernatural beings. Negating the sacrifice of a former Sorcerer Supreme, Jericho Drumm has opened the long-sealed gateway to Bondyè to ask the Voodoo Loa¹s for aid. However, what he finds in the strange god land may very well shatter his world forever! Written by Jonathan Hickman, penciled by Neil Edwards, cover by Alan Davis, variant cover by Jelena Djurdjevic. Kicking off the world-spanning new adventures of the Fantastic Four, this is part one of the Prime Elements arc: The Hidden City of the High Evolutionary! Featuring the return of the Mole Man, the architecture of the underworld, and the smartest Moloid you'll ever meet. Written by Jason Aaron, penciled by Roland Boschi, cover by Christian Nauck. Aaron's hellblazing, heaven-burning run on Ghost Rider roars to its dramatic conclusion with a confrontation that's been a long time coming. In one corner, we have the Ghost Rider brothers, Johnny Blaze and Danny Ketch. In the other corner is Zadkiel, the renegade angel. And before the battle is through, you can rest assured that blood will flow on the golden streets of heaven. And no matter who wins, will it mean the end for America's favorite Flameheads? Written by Dan Abnett and Andy Lanning, penciled by Brad Walker, cover by Alex Garner. A Realm of Kings issue! What¹s growing in Moondragon¹s belly, why is the Universal Church of Truth obsessed with keeping her, and can the Guardians rescue her before the planet they¹re on goes supernova? Written by Jeph Loeb, penciled and cover by Ed McGuinness, variant cover by Marko Djurdjevic. This is it! The Fall of The Hulks begins here. The opening round: The Red Hulk vs. The Thing with Reed Richards' life at stake. When the Baxter Building is attacked by the all-new, all-deadly Frightful Four, who will save the Fantastic Four? How about The Red Hulk? Not a chance. Written by Jeff Parker, pencils by Paul Pelletier, penciled by Carlos Rodrigues, cover by Ed McGuinness and Chris Sotomayor. Fall of the Hulks continues in this all-new series! What secrets will be revealed? What plans has the Red Hulk been hiding from everyone? And what does all of this have to do with the Cosmic Hulk robot!? Written by Greg Pak, penciled by Paul Pelletier, cover by John Romita Jr. He's fought Thor, Black Bolt, the Juggernaut, and virtually every Avenger on the planet. But nothing's ever hit Bruce Banner as hard as "The Fall of the Hulks"! As the epic storyline begins, Bruce Banner makes the best and worst discovery of his life, Skaar, the savage Son of Hulk, finally shows his true colors, and a Green Goliath in purple pants takes on Doctor Doom himself! "Planet Hulk" writer Greg Pak teams up with fan favorite penciler Paul Pelletier to deliver massive revelations, shocking emotional twists, and epic smashing that will transform Bruce Banner's life forever. Written by Greg Pak, Fred Van Lente and Jeff Parker, penciled by Rodney Buchemi and Gabriel Hardman, cover by Alex Garner. "Assault on New Olympus," part 3 of 4. Of all the giants, gods and monsters Hercules and his team of New and Mighty Avengers have faced in their battle through New Olympus, none may be as formidable as Hephaestus, creator of the immortals' fearsome war engines! With what fearsome device will he try to ensnare and destroy the Hercules/Amadeus Cho team, which has reformed at last -- only to meet their doom? Find out as Herc is on his biggest adventure yet! Plus: as the Agents of Atlas push into the stronghold of the Olympus group, Aphrodite decides to take matters into her own hands in Godmarked Part 3! Written by Matt Fraction, pencils by Salvador Larroca, covers by Larroca and Patrick Zircher. Tony's closest friends and lovers have gathered to try and help the man rebuild his shattered consciousness, body, life and legacy...but when Tony gets the call, does he want to come back? Can he...even with Dr. Strange, Master of the Mystic Arts, bridging the gap between the two worlds? And you didn't think the bad guys were going to just sit back and let Tony rest and recuperate, did you? Written by Brannon Braga and Marc Guggenheim, pencils by Phil Briones, cover by Brandon Peterson. Who is the Iron Axis and what makes them--yes, them--the deadliest foes Iron Man has ever faced? And what happens when the all-new, all-deadly Whiplash gets caught in the middle? Before he strikes in Iron Man 2, meet the latest version of this classic Armored Avenger foe in this in-continuity adventure! Written by Christos N. Gage, pencils and cover by Khoi Pham. The Coming Darkness..." Part 2. Can the Mighty Avengers and Dark Avengers join forces long enough to -- we're sorry, we can't even pretend to finish that sentence. There's no way the Mighty Avengers and Dark Avengers are teaming up. They're gonna beat the living heck out of each other! The only question is: can Hank Pym stop the Iron Patriot before he harnesses the power of the Cosmic Cube? Written by Brian Reed, pencils and cover by Sana Takeda. Ms. Marvel vs...Captain Marvel? What is behind the latest shocking twist in the life of Carol Danvers? It all leads to next month's huge 50th issue! Written by Ed Brubaker, pencils and cover by Steve Epting, cover by Steve McNiven, variant cover by Gerald Parel. Marvel's Origin story continues! Out of the ashes of the Project: Rebirth comes America's first Super-Soldier -- Captain America! Witness the first mission of Cap in New York...as Namor stalks the city streets and the Angel finds the hero killer he's been searching for. Written by Jeff Parker, penciled by Felix Ruiz, cover by Marko Djurdjevic. A young man has travelled billions of miles through space in a rocket to help our world. But is Earth of the 1950's ready for a new super hero? Before he became the dark figure the Agents of Atlas call The Uranian, Bob Grayson raced through the skies as Marvel Boy! From the critically acclaimed writer of Agents of Atlas and Fall of the Hulks: Alpha comes this all-new look back at one of Marvel¹s first heroes! Written by Brian Michael Bendis, pencils and cover by Stuart Immonen. Siege Blockbuster tie-in. Steve Rogers makes his triumphant return to the Avengers, but is he too late? With the Siege on Asgard begun, he must act swiftly, but who can he turn to and trust in a world with Norman Osborn in charge? When the gods fall, what chance does a Super Soldier stand? The biggest shake up since Disassembled starts here! Written by Dan Abnett and Andy Lanning, penciled by Andrea DiVito, cover by Brandon Peterson. A Realm of Kings tie-in! The Riddle of the Sphinx continues as Nova and Darkhawk find themselves teamed up with Black Bolt? But isn't he dead? Are these three very different heroes just pawns in the Sphinx¹s vast game, or can they break out and unravel his dark cosmic scheme? What exactly is the Sphinx trying to achieve and can any force in the universe stop him? Continuing the chronicle of the Marvel Universe, starting with Spider-Man (from Amazing Spider-Man #523 on), Iron Man (from Invincible Iron Man #2 on) and the X-Men (from Uncanny X-Men #514 on). Follow the history of the Marvel universe as it unfolds month by month with the all-new Official Index to the Marvel Universe. Each issue provides synopses for dozens of individual comics, including back-up strips, introducing you to the characters, teams, places and equipment that appeared within, providing vital information about first appearances, where they last showed up and where they appeared next! Written by Rick Remender, art by Tony Moore, cover by Mike McKone. Written by Dan Abnett and Andy Lanning, penciled by Kev Walker, cover by Brian Haberlin. Can the Imperial Guard actually team up with their hated enemies the Starjammers? They will if they don¹t want to be turned into worm bait by the giant decaying corpse they¹re trapped in! What horrors has The Fault unleashed now, and is someone else from our universe winning the race to explore this dangerous new zone? Majestor Gladiator will not be pleased! Written by Dan Abnett and Andy Lanning, penciled by Pablo Raimondi, cover by Stjepan Sejic. It¹s chaos in the streets of Hala as the Kree aristocracy rise up and revolt against the Inhumans! What legendary weapons have been unleashed upon the Royal Family? Meanwhile, in The Fault, Triton¹s expedition closes on the source of a mysterious and chillingly recognizable voice...have they found Black Bolt? Written by Jonathan Hickman, penciled by Stefano Caselli, cover by Jim Cheung. Nick Fury quietly moves his forces into place as the war between the armies of Leviathan and the armies of HYDRA kicks into gear. Also, the long-awaited origin of the mysterious Hive, and we finally find out who the father of Stonewall is. Written by Brian Michael Bendis, penciled by Chris Samnee, cover by Adi Granov. Siege Blockbuster tie-in. The Siege of Asgard has begun! And Norman Osborn and his Dark Avengers are leading the charge! Osborn's savvy use of the media fueled his rise to power ­ but the very tools he¹s been using may turn against him. It¹s time to expose Norman¹s true face to the world and uncover the secrets behind the attack on the gods! Witness the changing of the Marvel Universe firsthand! Written by Brian Michael Bendis, pencils and cover by Olivier Coipel, variant covers by Gabriele Dell'Otto, Joe Quesada and Coipel. Written by John Rhett Thomas, covers by Greg Land. Since the shocking finale of Secret Invaison vaulted him to national prominence and a newfound respect, Norman Osborn has been slowly organizing his power base, promoting his minions, eliminating his enemies -- and losing his sanity. Now, as he meets with the uber-powerful elite of the Cabal -- Doctor Doom, Loki and the Hood -- the final stages of his Dark Reign are about to be put into fruition: the taking of Asgard. Some might say such a plan is insane. And when you're dealing with the former and possibly future Green Goblin, we're not going to necessarily disagree with you! Siege: Storming Asgard ­ Heroes & Villians takes you inside the careful planning behind Osborn's crusade to take the kingdom of Thor off the board. Who are the featured players in the saga, how did we get here, and what are the many contingencies in this operation? With insider character bios and commentary from the creators behind the Dark Siege, this will make essential reading for kicking off the event in style! Written by Brian Michael Bendis, pencils and cover by Alex Maleev. The team of Bendis and Maleev brings the first arc of Spider-Woman's new life to a shocking conclusion. Jessica is face-to-face with the Skrulls who ruined her life and who shows up to help her? None other than the New Avengers! Or are they? Written by Mark Waid, penciled by Emma Rios, cover by Tomm Coker. Stephen Strange and his new apprentice travel not to the Ruins of Raggador or the Dread Dimension of Dormammu...but to a small Southern town conducting a bizarre ritual of its own, one that threatens the life of every young girl in the state! Plus: more on the secrets that Stephen himself is hiding from his student! Written by Kieron Gillen, pencils and cover by Billy Tan. Dr. Doom has committed barbaric atrocities against the Asgardians living in his realm of Latveria. Now Balder has marshaled his forces, and called upon the counsel of his general, Tyr, the God of War. Even the outcast Thor has rallied to the defense of his people. But what secret weapon has Doom wrought with secrets plundered from Asgard?! And whose side is the duplicitous Loki truly on...? Written by Jeff Parker, penciled by Miguel Sepulveda, cover by Francesco Mattina. Thunderbolts vs. Agents of Atlas‹round 2! The hunt down in the swamp comes to a head when one of the T-Bolts ends up dead! There's not going to be much time to cope either, because Norman Osborn needs his team of killers ready for a final mission‹and this is what he's been saving them for! Written by Peter David, pencils by Sean Chen, cover by Adi Granov. Tony Stark is a billionaire weapons makerŠwho¹s given a taste of his own medicine. When he¹s wounded and taken prisoner in the Middle East and forced to build a missile for insurgents, Tony creates a suit of armor to keep him alive and blast his way out! Now Tony sees the folly of his greed, and sets out to right wrongs as the armored avengerŠIron Man! Written by Paul Tobin, penciled by TBA, cover by Skottie Young. The Torino crime family continues their hunt for Spider-Man, and now they¹re not alone, as the mysterious mutants known as the X-Men are in NYC, stalking down Spider-Man on their own. ButŠ why are the X-Men after Spider-Man, and what can he do to stop them from taking away one of the things he holds most dear? Written by Paul Tobin, penciled by Ig Guara, cover by Niko Henrichon. The Avengers have barely moved into their new mansion before they have their first visitor, the super villain known as the Plant Man. But Plant Man isn¹t crashing the party, he¹s asking for help in his battle against a violently berserk Silver Surfer, an interstellar powerhouse intent on planting the Plant Man. How much will the Avengers put on the line to protect a super villain, and can even the assembled Avengers stand against the Power Cosmic? Written by Todd Dezago, pencils and cover by Mitch Schauer. The new ongoing series kicks off! Check out two new stories based on the animated series, The Super Hero Squad Show! It¹s Spider-Man from cover to cover in the latest senses-shattering edition of the wall-crawler¹s very own ongoing magazine! In addition to full-length comic-book stories, this issue features puzzles, games, pinups and a pull-out poster! Written by Duane Swierczynski, penciled by Gabriel Guzman, cover by Marko Djurdjevic. Written by Daniel Way and Marjorie Liu, pencils by Giuseppe Cammuncoli, cover by Salvador Larroca. Siege Blockbuster tie-in. Part 1 of 3. The end has come. While he is counted among the greatest gathering of villains the Marvel Universe has ever seen, one question remains: whose side is Daken really on? As part of the Siege on Asgard, what, or who, will he encounter in the land of the gods that will change him forever? Written by Paul Cornell, penciled by Leonard Kirk, cover by Simone Bianchi. Nate Grey, a.k.a., X-Man is back and he is not happy with the state of affairs in the Marvel Universe. So he goes straight to the man responsible -- Norman Osborn -- and it¹s not for a nice chat. It¹s X-Man vs. the Dark Avengers and Dark X-Men. Can this Omega class mutant survive this matchup? Find out here! Written by Daniel Way, penciled by Paco Medina, cover by Jason Pearson. "Whatever a Spider Can,² part 1.The X-Men? Pfft! Not really Deadpool's style. Though he¹s still committed to doing this "hero" thing, Wade¹s more of a "lone wolf" kinda guy, out there doing his own thing. Y¹knowŠthwp-thwp. Written by Adam Glass, penciled by Chris Staggs, cover by Humberto Ramos. Written by Victor Gischler, penciled by Rob Liefeld, Kyle Baker, Das Pastoras and Bong Dazo, wraparound cover by Arthur Suydam. ³Are You There, Deadpool? 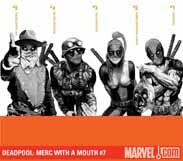 It's Me Deadpool.² Special double-sized issue. What do you do with a homesick zombie head? Take it back to the zombie universe, of course! Hopping through an interdimensional portal in the Florida swamp with Headpool tucked under his arm, Deadpool soon finds himself bouncing through a series of outlandish alternate realities, each more warped than the last. Wade Wilson, say hello to Major Deadpool, the Deadpool Kid and -- va-va-voom -- Lady Deadpool. Written by C.B. Cebulski, Becky Cloonan, Tim Fish and John Barber, pencied by Cloonan, Fish and more, cover by Dustin Weaver. Jubilee returns to the X-Men, Gambit has trouble adjusting to life on Utopia, Northstar deals with the distance that island living necessitates and No-Girl has to save all the X-Men from a foe living right under their noses. Written by Peter David, penciled by Valentine De Landro, cover by Christian Macneven. Utopia. The sanctuary for mutants to escape a world that wants them extinct. So is it the ideal home for X-Factor? That's what Cyclops believes when he invites the world's only mutant detective agency to relocate to their floating island retreat and take up residence there. But will Madrox and his team believe that it's the best place for them? What old faces will pop up, and what old acquaintances will be renewed? And will there even be a Utopia left when the mysterious Crone shows up and threatens to bring the entire place crashing down into the Pacific? Written by Zeb Wells, penciled by Paul Davidso, cover by Adam Kubert. What is Illyana Rasputin up to? In New Mutants #1, she returned from who knows where with knowledge that she says is from the future. A future where things aren¹t going well for the X-Men. Emma Frost is not going to settle for this question being unanswered. Written by Christopher Yost, penciled by Harvey Tolibao, cover by David Finch. "Kill Matsu'o," Part 3 Psylocke wants Matsu¹o Tsurayaba dead for what he¹s done to her. But it turns out that she¹s not the only one who wants his head. Now, Psylocke is in a race against a super-powered assassin to get to Matsu¹o firstŠbecause if anyone is going to end Matsu¹o, it¹s going to be her. Written by Kieron Gillen, penciled by Steven Sanders, cover by John Cassaday. Agent Brand, Beast, Sydren, Beta Ray Bill, Marvel Boy, Jazinda, Karolina and all the other aliens on Earth have been captured by Henry Gyrich and his "No More Aliens" agenda. Only one person can free them and save the world: Lockheed. Written by Scott Gray, pencils by Scott Koblish and Nelson DeCastro, cover by Reilly Brown. The Knights of Hykon continue their assault! Drowning Shadow, Sleeping Mist and Bone Dancer join the battle as the X-Men struggle to survive! Nick Fury and SHIELD face total destruction! Nightcrawler enters the enemy's lair, and makes a heart-rending discovery! But Peter Corbeau has the most shocking news of all ­ and it's going to have Cyclops seeing red! Written by Matt Fraction, pencils and covers by Greg Land. "Nation X," part 6 of 8. There's a rogue Predator X stalking mutants beneath New York City and it's down to Wolverine and Fantomex to hunt it down. There's an island in the San Francisco Bay that the mutants call home and it's slowly sinking -- and only King Namor can save the day. And meanwhile, in San Francisco, a supermob is making life hard in Chinatown...somebody call the X-Men! Written by Daniel Way, pencils and cover by Doug Braithwaite. "Seven the Hard Way," part 4 of 5. Wolverine¹s plans have hit a snag. With Romulus breathing down his neck, Wolverine struggles to get his last piece on the board. And the fact that she¹s in prison doesn¹t exactly make it any easier. Written by Jason Aaron, pencils by Yanick Paquette, cover by Adam Kubert. In the crazed conclusion to "Insane In the Brain," Logan's stay in the whacked-out Dunwich Sanatorium finally comes to an end as his pals Psylocke and Nightcrawler show up to rescue him from the maniac clutches of Dr. Rot. But even if they can save his life, is it possible to recover what he's lost of his sanity? Written by Frank Tieri, penciled by Paul Gulacy and Paco Diaz, cover by Ben Oliver. A camera crew torn limb from limb attempting to shoot footage of a mythical beast in the deepest forests of Canada. Two survivors spouting wildly diverging stories about a ferocious, white-furred monster and the mysterious stranger that came to their rescue. How are the police to make heads or tails of all of this? Let¹s go to the videotape! Also featuring: ³Wolverine Vs. Thor²: Want to see what happens when a jerky-chewing kanuckle-head steps up to the Asgardian God of Thunder? Let¹s just say that it doesn¹t involve tea and biscuits. 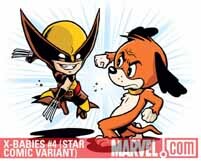 Featuring Wolverine and Logan in their first encounter, which first debuted on Marvel Digital Comics. Written by Gregg Schigiel, penciled by Jacob Chabot, cover by Skottie Young, variant cover by Chabot. The gloves come off! The X-Babies are in way over their heads as they¹re overwhelmed by adorable-ness. Can they, even with the help of the Star Heroes, survive? And when the dust settles, control of the Mojoverse goes to...? The X-Babies status quo changes forever in this issue! Plus, a Star Comics reprint! Written by Peter David, penciled by Bing Cansino, cover by David Yardin. Something is rotten in the state of Latveria. How does it relate to the disappearance of the Invisible Woman? How does it involve Layla Miller, and is she now an ally of Doctor Doom, with all of her precious knowledge at his disposal? Will Madrox learn exactly who is buried beneath that mysterious grave? And will you buy the issue in order to find out? We dunno; what're we, psychic? Written by Christopher Yost, Craig Kyle and Duane Swierczynski, pencils and covers by Clayton Crain. X-Force has a new mission: Kill Selene. As Utopia burns, Wolverine and the team heads to take down the Black Queen and rescue one of their own, but they have no idea what they're in for when they arrive on the shores of Necrosha. The biggest X-Force story yet continues as Selene's Inner Circle begins to tear itself apart, and the truth about Wolfsbane is finally revealed. Part 4 of 6. Written by Chris Claremont, pencils and covers by Tom Grummett. Great jumping on point...the fate of Perfect Storm! The last time we saw Storm, she was fleeing from the X-Men, having blinded Sabretooth and killed Logan. Now, we turn our focus to Wakanda to see what became of the evil clone of the woman that the X-Men loved and trusted. Aslos: new two-part story starting with Issue 16 as Claremont continues his landmark run on X-Men Forever! Plus, an extra feature detailing a timeline of what other Marvel Universe stories were occurring during the current X-Men Forever saga! 40 pages, $3.99, 32 pages, $3.99. Written by Mike Carey, pencils by Clay Mann, cover by Adi Granov. "Necrosha," part 2 of 3. A classic X-Villain hitched a ride on Destiny¹s body when Selene brought her back from the dead. But this villain doesn¹t want to be part of the Black Queen¹s master plan. He¹s got his own agenda. So it¹s up to Rogue, Nightcrawler, Colossus, Psylocke, Husk, Blindfold and Magneto to take this villain down. Written by Fred Van Lente, pencils and cover by Dennis Calero. "The Genosha Bay guards rolled Angel, gagged and shackled to the gurney, into solitary confinement, warden Emma Frost trailing close behind. From the ceiling and every wall bright, hot lights pounded a blinding glare onto the cell's only furnishing, an ominously solitary chair. 'Until you tell me what I want to know,' Warden Frost said, 'You will never leave this room. Welcome to Project: Wideawake." Written by Stuart Moore, art by Jesse Delperdang, cover by Adi Granov. The X-Men Origins series continues with this month spotlighting Cyclops! Witness the origin of the X-Men¹s leader from his childhood through his joining of the X-Men with both classic moments and a few scenes that you¹ve never scene. Written by Jason Aaron, penciled by Steve Dillon, cover by Dave Johnson. "Kingpin," part 3. Wilson Fisk's plot to become Kingpin of New York finally brings him face to face with Frank Castle, as well as drawing in a 97-year-old, shotgun-toting mob widow and a mysterious hitman known only as The Mennonite. Written by Rob Williams, penciled by Laurence Campbell, cover by Tim Bradstreet. Barracuda murdered Frank Castle¹s old friend Yorkie, but death¹s not going to stop him calling in one last favor. Across the Atlantic on a bleak Welsh mountain range, Yorkie¹s old S.A.S. squadron have come home from Afghanistan with a little something extra, and Yorkie¹s son is taking his life into his hands by spying on the deadliest soldiers in the world. This is where the S.A.S. put their new recruits through hell -- the perfect place for Frank¹s unique brand of vengeance. But is he the hunter or the hunted? Written by Laurell K. Hamilton and Jessica Ruffner, penciled by Ron Lim, cover by Brett Booth. Anita¹s trapped in Harold Gaynor¹s mansion, and her only way out is to go toe-to-toe with a voodoo priestess¹ nightmarish creation! It¹s the showdown everything has been building up to in the blood-soaked penultimate chapter of Laurell K. Hamilton¹s best-selling thriller! By Ed Brubaker and Sean Phillips. Tracy Lawless is getting close to finding the killers he's been searching for... but before he can put all the pieces together, he finds himself in their crosshairs in Chinatown, with enemies all around him. This can't end well, or wouldn't be an issue of Criminal, would it? All the single issues of Criminal are packed with articles and extras that are not reprinted in the collections. Written by Christopher Yost, pencils and cover by Pasqual Ferry. The stunning conclusion to Orson Scott Card's award-winning classic sci-fi novel! Ender and his jeesh are being pushed to the breaking point by Mazer Rackham, the only man ever to defeat the Formics. But as the Third Invasion approaches, the games are getting more intense by the day. Can Ender win? And who is he really playing against? Himself? His teachers? Or someone else? The final game ends here. Written by Mike Carey, penciled by Sebastian Fiumara, cover by Timothy Green II. Bean and his companions are now reunited with Ender, and under his command they face what they're told is their graduation exercise. The assignment: defeat the Formics in a range of simulated attacks which will stretch them to their limits. But Bean knows they've been lied to. He also knows that if Ender fails, it will fall to him to do the unthinkable. The companion series to Orson Scott Card¹s award-winning classic concludes here! Written by Peter David and Robin Furth, pencils and cover by Jae Lee and Richard Isanove, variant cover by Patrick Zircher. Gilead is in ruins and Steven Deschain¹s Affiliation has been drastically reduced in size, the result of the attack of the Good Man, John Farson. But young Roland and his ka-tet intend to strike a blow for the Affiliation by exploding an ancient oil field the Good Man is using to power his machines of destruction. Roland may never get the chance to strike back because in the midst of Gilead¹s survivors there resides‹a traitor! Written by Fred Van Lente, art and cover by Francis Portela. "Greetings! I am the monitor of Line Installation 1-4. I am 6-8-6 Ebullient Prism. My function is to collect and inspect any and all specimens captured within this sector for evidence of immunity to infestation by The Flood. I require your assistance. Please do not move while you are dissected and all your tissues are properly analyzed and cataloged." Written by Crisse, Mitric and Hicks, adapated by Aubrey Sitterson, pencils and cover by Humberto Ramos. The titanic red wave of destructive energy has nearly destroyed the entire universe; without anyone surviving long enough to ask themselves why! The passengers of the space cruiser K, the only survivors in the galaxy, found refuge on Eyrolia, the mysterious ³Planet of Illusions.² But far from being saved, they are captured by the terrible Master-Guardian of the planet who sees them as invaders, coming to steal the jewel he protects at the heart of his planet. Only one being thinks he can stop the madness that is destroying their reality. He is the Paladin, and for him there can only be one culprit: the Kookaburra, almighty reincarnateŠ Under Mitric¹s quill and drawings by Ramos, discover the conclusion to the Kookaburra K trilogy. Written by Eric Shanower, pencils and cover by Skottie Young. War comes to Oz as the sassy General Jinjur and her army of amazonian milkmaids storm the city gates. And what do the ladies want? Gems, Fudge, and Sandwiches with the crusts cut off! Well, that and the head of King Scarecrow. Join the best-selling team of Eric Shanower and Skottie Young as the revolution heats up! Written by Barbara Canepa, adapted by C.B. Cebulski, pencils by Alessandro Barbucci, covers by Barbucci. Addio-Colonnello is a distant town, a port beyond the oceans, many moons away from our Bohemian lands. Tragedy strikes when Nosferatu launches his assault, commanding his legion of vampires to descend upon this town. This is how the Lords of the Vampire Parliament make their point. The mission of Daffodil, Globuline and Achilles, three beautiful agents of the very same Vampire Parliament, is apprehend Nosferatu and uncover the motive for his crime. Written by Brian Michael Bendis, art and cover by Michael Avon Oeming. Walker's past has come to bite him right in his ##$! big time and it's going to take a @#$@#$ and a $@#$@ to get him out of the !@$#@#$@$@$@. It's another potty mouth chapter in the award winning cops-meets-capes epic saga.